While the three-dimensional cubic foot gets much of the attention in water softening, the two-dimensional square foot plays second fiddle; πr2 is no less as important as πr2h. In filtration, the square foot receives most of the attention in surface loading rates and backwash rates. Surface loading also applies to softening and affects the quality and capacity of water softening applications. Robert B. Hill (a pioneer in the Minnesota water industry, Founder of Hill Water in Minneapolis in 1958, and a personal mentor) taught that gallons per minute in softening matter most. He would say: “Pay attention to the flowrate per square foot when softening water first. The cubic feet take care of themselves when you apply the correct bed depth.” At Hill Water, the focus was commercial and industrial applications where pressure drop and high-quality soft water was everything. Cubic feet matter in service runs, but square foot loading rates determine pressure drop and even flow patterns through the bed. Pressure drop and flow patterns matter in all softening applications, whether they are large C&I systems or residential softeners. The surface loading rate is the volume of water passing over a media bed’s surface area over time. It is linear because it is two-dimensional. 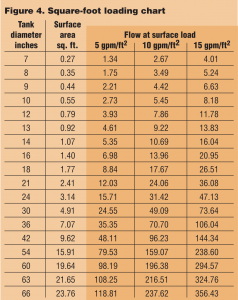 This hydraulic surface loading rate in water treatment terms is gallons per minute per square foot (gpm/ft2). Useful tool: A quick way to get from a tank sized in inches to a surface area in square feet is to use this equation: D2/183. Example: a 24-inch diameter tank is (24 x 24) ÷ 183 = 3.14 ft2 of surface area. This is a simplified equation from πr2/144 (radius in inches to area in square feet): /144 = π (0.5D)2/144 = 0.25D2/45.83 = D2/183.32 (see Figure 1). The GE Handbook of Industrial Water Treatment states: “Operating well below the manufacturer’s recommended flowrates can also negatively affect softener performance. At low flowrates, the water is not sufficiently distributed and the optimum resin-water contact cannot take place.”1 What this means is hydraulic surface loading onto a resin bed must be high enough to force water evenly through the bed and expose the hardness ions to the IEx sites (see Figure 2). If the flow is too slow, water will always find the course of least resistance and can channel, creating hardness leakage into the soft water. To avoid channeling, design for a minimum flowrate of one gallon per cubic foot and a minimum surface loading rate of four gallons per minute per square foot. There are calculations that go as low as two gpm/ft2, but at that point, channeling may occur. It is possible to engineer bottom distribution to accommodate low flow in industrial equipment by creating back pressure, but this is not an economic option for commercial and residential equipment. In addition, a slow-flow designed bottom collector will experience extreme pressure loss during high-flow events. Water softeners that see a wide variation in hydraulic loading tend to have issues with hardness slippage through the bed. For example, a hospital with a single softening system that services the entire facility may see loading rates of 200 gpm (757.08 L/min) to 10 gpm (37.85 L/min) or less. A boiler or reverse osmosis unit in this facility requiring hardness levels under one ppm, and running 24/7/365, can have problems getting this quality water during minimal activity in the facility. Water meant for domestic (laundry, bathing, kitchen and bathroom) use is seldom adequate for applications needing extremely low levels of hardness. There is a huge difference between two- to three-grain (34- to 51-ppm) water and one- to two-ppm soft water. When developing a plan to provide soft water for sites needing both domestic soft water and high-grade, low-hardness water, consider installing a polishing softener ahead of the systems needing less than one ppm hardness. Another answer for varying flows is progressive systems, which use multiple softeners plumbed in parallel that come online and offline as loading requirements change. Three water softeners, each handling 50 gpm (189.27 L/min), handle a maximum flow requirement of 150 gpm (567.81 L/min). When the flows run between one and 50 gpm, one softener is online. When the flow exceeds 50 gpm, the second unit comes online and so on. In this way, the hydraulic loading spreads over smaller units to avoid hardness leakage due to low flows. Caution: Whenever multiple units work together in parallel, the law of averages come into play. At some point, one unit will be regenerating and another will require regeneration due to exhaustion. It is impossible to have perfect balance in a header and with progressive, or any multiple parallel configuration, there is no way to measure perfectly volumetric use. There is a ± accuracy to anything mechanical; it’s inevitable that hard water will happen. It is possible to calculate buffers into the capacity settings and short-cycle the equipment but this is extremely inefficient and often costly. The only way to have true 24/7/365 soft water is with an alternating configuration. Manufacturers of IEx resin provide volumetric loading per cubic foot and surface loading rates per square foot. These vary based on the application. For softening water, they range from a minimum of one gpm/ft3 to a high flowrate of 10 gpm/ft3. Ion exchange happens very quickly so resin can pull hardness at higher rates but high flowrates create excessive pressure drop across the system. Using 10 gpm/ft2 for a continuous flow with an intermittent peak of 15 gpm/ft2 avoids issues related to high flow for domestic use softeners. To ensure low hardness leakage, use six to eight gpm/ft2.2 This was the rule used successfully for 55 years at the Hill Company. The higher the flowrate, the greater the pressure drop (ΔP) across the system. 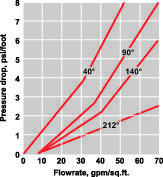 Resin pressure loss curves normally show loss per foot of bed depth. A softener with a three-foot bed depth flowing at 10 gpm/ft2 will experience approximately 4.5 psi ΔP at 50°F. If the flow doubles to 20 gpm/ft2, the ΔP increases considerably3 (see Figure 3). The Water Quality Association certifies domestic water softeners at a ΔP of 15 psi. 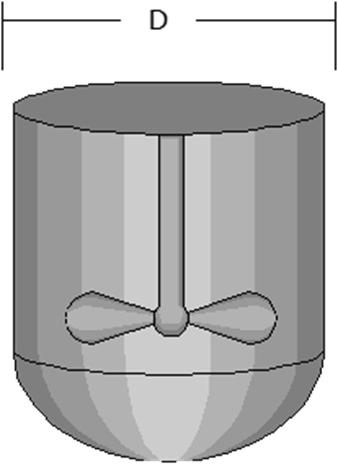 A one-cubic-foot softener in a 10-inch (254-mm) diameter tank has a surface area of approximately 0.5 ft2. A majority of residential softeners sold in the US are one cubic foot. A common one-cubic-foot softener design can have service flowrate at a ΔP of 15 psi of 14.5 gpm.4 This works in a one- or two-storey standard home with a couple of bathrooms. Add three stories, hundreds of feet of piping with four bathrooms, high-flow faucets and ergonomic shower heads, and pressure loss becomes problematic. Taking time to calculate pressure loss and apply the results to tank diameter avoids issues of low pressure to the fixtures and unhappy customers (see Figure 4). 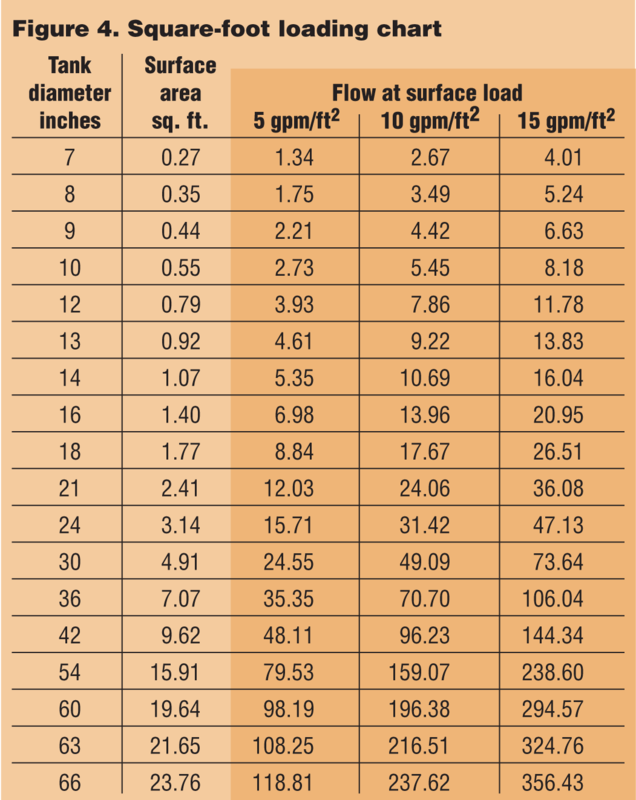 There are many resources available for discovering the proper loading rates for standard softening resin. Be diligent and double check that the vessel intended for the application is the correct diameter. Know the application and when in doubt, consult an expert. GE Handbook of Industrial Water Treatment, Chapter 8, (1997). www.gewater.com/handbook/index.jsp. Retrieved February 3, 2014. Slovak, R. (2004) Guide Line for Sizing Water Softeners, www.wcponline.com/PDF/0304%20Water%20Softners.pdf. Retrieved from the WWW on February 8, 2014. 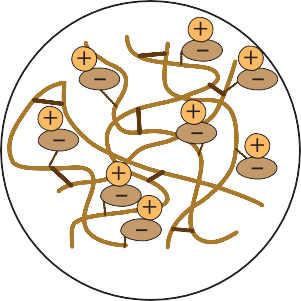 C-800H Strong Acid Cation Exchange Resin. www.aldexchemical.com/products/c-800h-strong-acid-cation-exchange-resin/3. Hellenbrand H100 Series System Specifications. Special thanks to Chubb Michaud (Systematix), Frank DeSilva (Resin Tech) and Robert B. Hill. Matthew Wirth, General Manager of Pargreen Water Technologies (www.pargreen.com), is a second-generation water professional with over three decades in the industry. He received engineering training at the South Dakota School of Mines and Technology, Rapid City, SD and also earned a BA Degree in organizational management and communications from Concordia University, St. Paul, MN. In addition, Wirth holds a Water Conditioning Masters License in the state of Minnesota. A contributing author to WC&P, he is also a member of its Technical Review Committee. Wirth can be contacted via email, mwirth@pargreen.com or phone, (630) 433-7760.